Hi there peeps. Bet you thought I had drifted off to someplace unknown. Well I have been keeping a bit busy with travel and such and tomorrow is my birthday. Yesterday I went to see my sister and we had a nice visit. We hadn't seen each other in quite some time and I got to view her new home and we had a good time catching up on things. Traffic was not so good coming back. I always question why construction on a busy highway and turning 2 lanes into one during the busy times of the day, it's like sitting in a parking lot and moving inches every few minutes. I am so glad I do not drive for a living. I do appreciate those who do but you are crazy to be putting up with that. Onto better things. 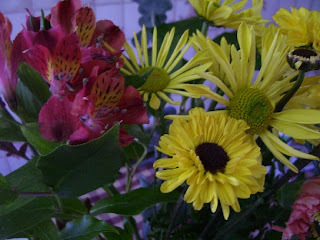 Take a look at these lovely flowers my big Sis gave me yesterday. They are sitting on my table where I create and they smell ever so loverly. Robin isn't really a computer girl but I will thank her here anyways just in case she comes by. They just brighten up the room. Next, my friend Jeanie made some key tags from the little tutorial that I put up here a while ago made out of samples for counter tops. Well last night after supper I was feeling a little antsy so I put that energy to good use. I made up a few more. 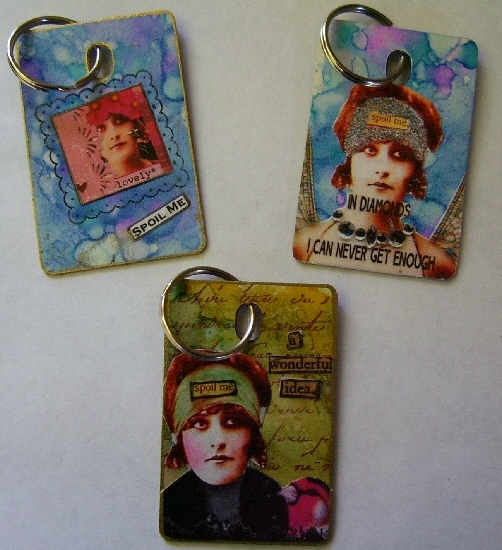 These ones had a plain cream background so I used my alcohol inks and then used Artchix images for the focal point and cut and added some words on a couple. The green one turned out really cool and of course green is my ultimate fav colour so it is already hanging on my key chain. Woo hoo I actually kept something I made. I really modged the image on there too so it won't come off very easily, and I used a gold paint pen to go around the border to give it a finished look. And.... I know every one is so sick of winter and cold and snow but I have to show you these snowies. I will be doing more of these for my fall shows but I was so happy with how they turned out I wanted to make you smile Ü. The middle guy is my first one and I wasn't sure how it was going to turn out and it did better than I thought. These are gourds I grew in my garden last year. I had lots of them. There is quite a process before the paint stage. We put them downstairs in our basement over the winter thinking the wood stove would help them go through the dry out process. Well we had all these little flies in the house and when I asked the girls in my paint group what was going on they all told me they just put them out in their garages. Well they get all moldy and when they are ready you have to clean this dirt and mould off them, dry them and then you can paint. YUCK but well worth it in the end. The hats are made of air dry clay then painted and dry brushed as well as the noses and buttons. ﻿These are just my first and I hope to do some penguins and more snowies with different faces. And, I have not forgotten about my giveaway. I have been trying to make a few things and I will be going through some of my stash to put together a goody bag. I am so happy to have to date 110 followers and over 200 posts. I can't thank everyone enough for dropping by and leaving such lovely comments. Stay tuned for my Blog Giveaway. Tomorrow is my birthday so another reason to celebrate and give back to those that have been so generous to me. Love your tags and your Snowies! Have a great day tomorrow. Happy Birthday Les!!!!! I am sick of the cold but I still adore those snowies! Too cute Les.. love those snowies.. the tags are gorgeous.. I can't believe I don't have any of these in the stash..lol Hope you had a lovely b-day!!! Love your tags (green one is my fave one too! 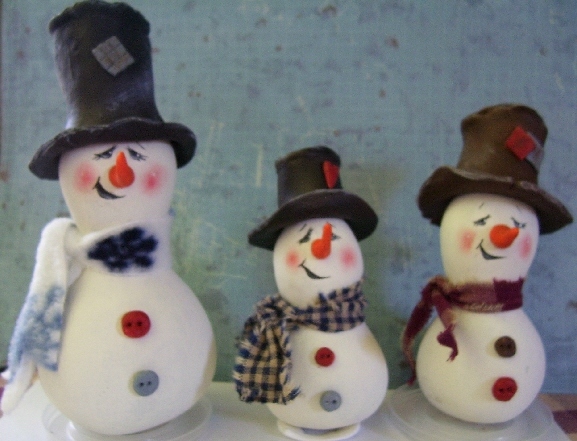 )and your Snowies are soooo cute! Love their lil hats!